This member spotlight features an interview with @Frank, Programs Director and Technical Lead for the Centre for Conflict Transformation and Peace Studies (CECOTAPS) in Ghana. @josephnyaaba is the Resource Manager for CECOTAPS. Our mission is to create opportunities and build capacities of institutions, communities, and individuals for peaceful coexistence in the three regions of northern Ghana. Since 1999, CECOTAPS has been working on educating community members in northern Ghana, especially women and vulnerable groups on legal regimes that protect their land and natural resource rights on land and other natural resource products. However in 2016, and under the Agriculture and Natural Resource Management Project, CECOTAPS has taken steps to help women and vulnerable groups to register, formalize and document their land and natural resource rights. This has improved tenure security, livelihoods, food production and also reduced land conflicts. What problems or issues does your legal empowerment work address? Even though women constitute half of the agricultural labor force and produce more than 70% of the food, they are still poor. The situation can be attributed to the fact that 90% of women have no secured rights to lands compared to 7% of males in northern Ghana. This disparity in land ownership is rooted in tradition which forbids women from owning land. With 80% of land in northern Ghana under customary administration, the woes of women are deepened and the tragedy of undefined social identity has also affected their access to land and tenure security. An assessment of land tenure in Community Resource Management Areas (CREMA) in the three northern Regions revealed that women have access to land but had weak tenure security. Women’s access to land is determined by male family relations, stability of marriages and inheritance. Others access land through gifts and pleas; which does not give women permanent interests. Women interests in land are mostly lost when a husband dies or there is divorce or the woman grants rights to others without consulting her husband or male relations. Women have to compete with male relations when they have improved the fertility of land or increased its value with tree crops. In most cases they lose out. How are you using legal empowerment to address these problems? CECOTAPS facilitated a community led initiative that leverages on technology, culture and statutes to formalize and improve land rights for women under the Community Resource Management Areas (CREMA) framework. A CREMA is a robust natural resource governance structure clothed with state power to manage landscapes with significant biodiversity. The strategy has been to engage traditional leaders and landlords to appreciate the need to offer women long term interests on farms they till. The second phase built capacities of women leaders on human rights, land laws and Interest Based Negotiations (IBN) to equip them with skills for negotiating for land and natural resources. Lands are demarcated using GPS devices by community members and plot maps are developed. A land use agreement is signed with chiefs and CREMA executives as witnesses after which these documents are publicly displayed. The land formalisation process has proven to improve tenure security for women, prevented boundary conflicts, and promoted environmental stewardship at the community level. Is there an aspect of your legal empowerment work that is particularly innovative? Cultural underpinnings in northern Ghana have always limited women access and tenure security to land. However, the State Interstate Law which sought to correct this imbalance has failed to provide women access and security to land when their husbands die. The Land Administration Project encouraged women in urban spaces to have land titles, but neglected women and vulnerable groups in rural communities. Furthermore, the high cost of land registration, bureaucracy, corruption and centralization of the process has limited women’s participation in securing land rights. CECOTAPS’ land formalisation is a community led process of empowering women and other vulnerable groups to legally improve their access and tenure security to land. 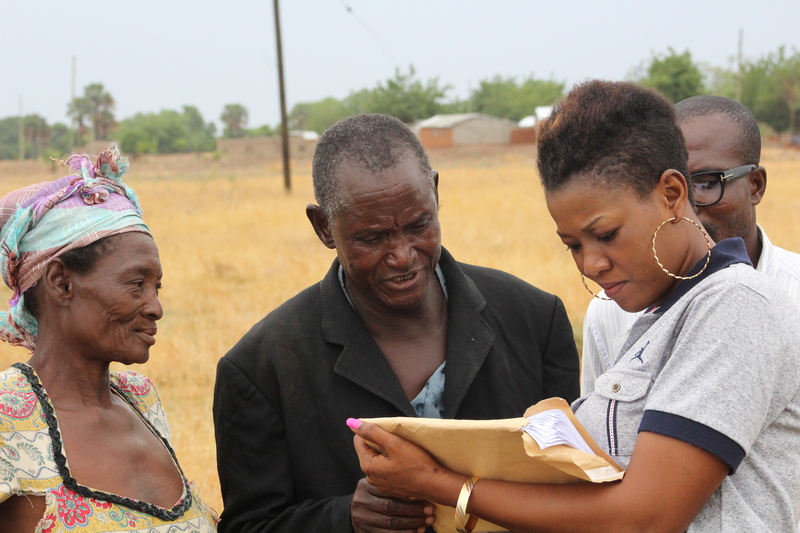 With the technical backstopping from CECOTAPS, land parcel maps are generated and validated with community members who have interest on the parcel. A land use agreement is then entered between the leasor and lessee which spells out the commitment of each party and sets the basis for the abrogation of the agreement. The signed agreement is witnessed by a chief “Tendana” and a CREMA Executive Committee member. Copies of the agreements are kept with the parties, CREMA and local government offices. The land formalisation process has given 687 women and other vulnerable groups in 32 communities fixed term of tenure security over 549 hectares of land. This spans from a minimum of 10 years to the death of the leasee. 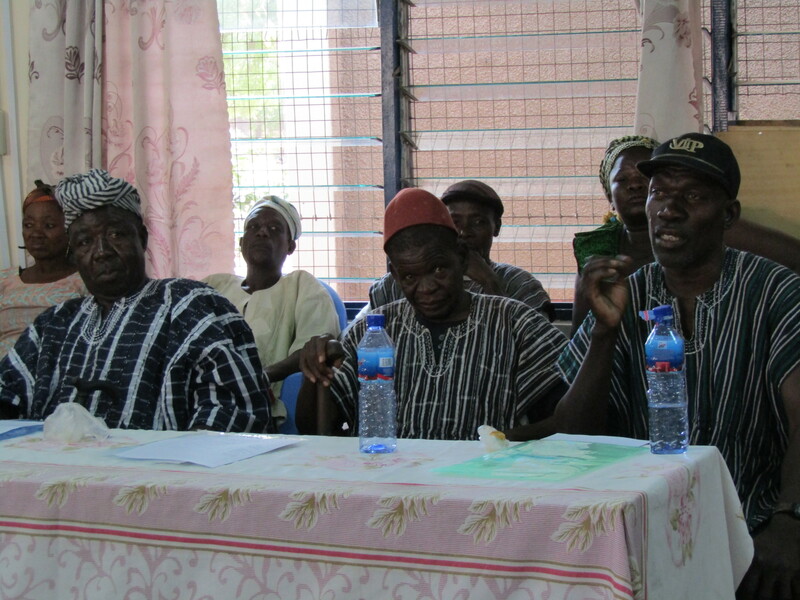 This is unprecedented in the annals of land governance in Ghana where communities have decided to formalise land rights for its members. The long term goal is to codify this data and develop a hierarchy of resource ownership and succession for each community. The land formalisation process fits into a broader framework of community facilitated land use lands, which will provide a blueprint on how communities can manage their land and natural resources sustainably. The land formalisation process has been built on a Community Resource Management Areas (CREMA) framework which is a robust community based platform for rallying support for sustainable natural resource management. Therefore communities own and drive the process of formalising land rights; with the support of traditional leaders and Customary Land Secretariats, CREMA executives and local government structures. Traditional leaders have been educated and trained on the land formalisation process to get their buy in and support. One key sustainability strategy is the training of 45 (120) Community Land Demarcation Volunteers (CLDVs) who use GPS devices to demarcate land parcels. This is to ensure that after CECOTAPS exits, communities can successful carry out this exercise. The CLDVs and 75 Community Land use Advocates were also trained on land laws sustainable land management, multiple water use system (MUS) and conflict analysis and resolution. The capacities of the women have also been built in Interest Based Negotiations, Intestate Succession Law and Human Rights to help them negotiate for land and other productive resources. The CREMA Executive Committees are being capacitated to charge affordable fees for land formalisation process when the Agriculture and Natural Resource Management Project has ended. Community land formalisation processes can easily be scaled up if it is linked with agricultural and natural resource interventions. It is advisable to leverage on already existing community structures to initiate project activities. A key success tool is to build the capacities of relevant existing community structures and redirect their focus to the community land formalisation process. Creating new structures increases cost, destabilised community cohesion and often results in conflicts if not properly managed. There should be a sustained and coordinated approach of sensitizing, educating and building capacities of community actors throughout project initiation, implementation and existence. The process must involve traditional authorities, community members, government agencies and community-based organisations participating at every level of the process. Sensitization and transparency clears doubts from actors resulting in an unalloyed commitment to the process. Capacities of local actors must be increased, such as in interest-based negotiations, sustainable land management, multiple water use system and mapping activities. The building of community based human capital fast tracks the process and drives sustainability. CECOTAPS observed that the use of community trained volunteers drive community ownership, participation and builds trust among all stakeholders. Communities associate and engage well with their kinsmen which gives the land formalisation process a community endorsement. The trained volunteers reduced cost of operations and potential conflicts while increasing the parcels of land formalised. Communities must lead the process of land formalisation with technical backstopping from the implementing organisation. Decisions should not be forced on project actors but there should be compelling reasons for communities to organically react positively to project activities. Where communities sacrifice or commit resources, they own, participate and drive the process and it is less likely to fail. An interesting situation unfolded in Wiesi, a CREMA community in the Builsa-Yening (Upper East Region of Ghana) during Land Use Rights Formalization (LURF). In the course of engagement, Akarama Agaare who had earlier in 2017 leased a parcel of land to his daughter in-law Juliana James, decided to release the same parcel to Felicia Atibil. Felicia is a young widow who had just returned to Wiesi from Kumasi after the demise of the husband. Akarama had asked the team to demarcate the same parcel for Felicia but upon further interrogations, it was realized that the parcel had already been leased. The team, with the support of Stephen Amankwa (CREMA executive), Bernice (CLDV) and Samuel Atibil, explained to Akarama why the land cannot be re-demarcated for another person when the terms have not been breached. The land use agreement was pulled out and the terms for annulling the agreement were read and explained to the parties. Akarama later agreed that the daughter in-law had not breached any of the terms stipulated in the agreement and it will be unfair for him to take the parcel away from her. He promised to get Felicia a different parcel and for it to be documented in her name. Probably, this is the first major test for LURF and its acceptance by community members. The situation at least showed community members respect for signed agreements and willingness to apply the terms therein. The LURF has successfully prevented a dispute in the community. However, we will continue to monitor the situation on how effective the resolution has been in terms of providing unrestricted land use rights for Juliana James. Mr. Sayibu Adama is a pastoralist (Fulani) who has lived in Guah, a community in the Dorimon Community Resource Management Areas for the past 30 years. In one of our educational and sensitization efforts in Guah, Sayibu expressed interest in the Land Use Rights Formalization (LURF) process. He understood and appreciated the security and opportunities the LURF offers for his livelihood and animals. This was significant because of the long standing history of conflicts between pastoralists and crop farmers in the area. Cleopatra Amankwa and Felicity Aburiya facilitated engagement with the Chief of Guah, Naa Danyagri Amadu, and his elders on the possibility formalizing land use right Sayibu. During the negotiation process, Naa Danyagri had good words for Sayibu “he has been with us for over 30 years and coexisting peacefully with all of use despite his large herd and his ability to control them has won him high praise from community members” For this reason, the Naa Danyagri Amadu instructed Gusenaa Yizikori, an elder in Pase to lead the team to a parcel of land to be demarcated for Sayibu Adama. A 14.04 acre land was delineated for Sayibu and his family and the duration of lease is for life but it the rights were not transferable. “It is special day for me and I can do something meaningful on the land” (Sayibu, Guah, 2018) Sayibu later divided part of the parcel to his four wives. What are some key lessons that you have learned, and can you share any tips with other members of the network? Communities have relevant inherent knowledge that should be tapped and integrated into project activities for successful implantation and positive outcomes. Community leaders must effectively be engaged so information that has been disseminated among community members is not seen to erode or suppress their authority in their communities. Community leaders and members must lead the process of legal empowerment. Training and education opportunities must be tailored to meet the various community interest groups. Sometimes it’s necessary to send beneficiaries out of their communities for training activities, exchange visits and also for change of environment. This intervention has changed mindsets and triggered behavioral change among community members. We have encountered instances where some lessors agree to give land and later reverse their decision. This reluctance may be an indicator of unspoken apprehension or concerns, which must be addressed before moving forward. Many of the men were a bit hesitant to document their land rights at the onset of the exercise, but as the process progressed, more expressed their interest. This is understandable because land rights are very sensitive issues and people are careful especially when paperwork is involved. Therefore, sensitization, patience and follow up visits to communities are important to gain confidence from the people. The basic documents used for LURF registration are a person’s voter identification card (ID) and National Health and Insurance Scheme (NHIS) ID cards. We have however observed that in some cases the information on the ID cards are not accurate or profiles of community actors are inconsistent with official documents (NHIS or Voter ID). Thus, the AgNRM team recommends that Community Land Demarcation Volunteers compile the list of interested community members because they can cross check the information. It appears some husbands hide behind the joint ownership to still have significant control over lands when they have conveyed rights to others. Formalization of land rights should not take more than two weeks after land demarcation to eliminate the process of re-negotiations. Establishing a mobile field office at the community level (where appropriate) fast tracks the generation and delivery of documented land rights. It also reduces cost and provides opportunity for the transfer of skill sets to community members. Great initiative. Looking forward to reading more about your best practices. Good luck!! !